The poster is as simple as its message. 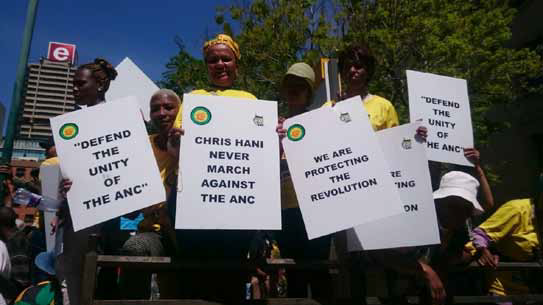 With just two logos, that of the ANC Youth League and the ANC, the black text boldly reads, “Chris Hani never march(sic) against the ANC”. We often see this, when it is comrade against comrade: the spirit and memory of stalwarts long gone are summoned readily. In this debate, Chris Hani’s memory would not be overlooked, when it could easily be deployed to “caution” those with a different perspective. The poster, and whoever authored it, did however overlook something else: Chris Hani did protest against the ANC. Like in a theatre play, transition away from such an interregnum often needs the “exit stage left” by the “old” and “enter stage right” of the “new” so that the play can continue. This has happened before in the history of the ANC, at many stages in its 104-year history. I am interested in two stages, when the “old guard” and the “youth” were in conflict and what was at stake was control of the party machinery and the continued struggle for the total liberation of Africans in particular and blacks in general. More importantly what “variety of morbid symptoms appear” during both periods? Their appearance leads me to believe that they are recurrent features of the history and present of a party in irreparable decline. Also, the parallels are too obvious to ignore: the Hani memorandum led to the historic Morogoro Conference in 1969, and the #OccupyLuthuliHouse campaign has at its center the demand for a Special Consultative Conference. The first part of this history relates to the organisation during the days of the Native Representative Councils (NRC) and other structures such as the All African Convention (AAC) and its rejuvenation by the ANC Youth League in 1944. Luyanda ka Msumza and Robert Edgar argue that, despite the varied class composition of “Congress Youth” at the time, what brought them together was “… their impatience with the unwillingness of the ANC ‘old guard’ to adopt militant tactics to contest white rule”. In addition to this, there was the critique that ANC leaders had “grown remote and aloof from the African community and were trapped between apprehensions over losing the few privileges (by virtue of their involvement in the NRCs) they received from the government and their qualms over mass African protest bringing down the wrath of the government”. 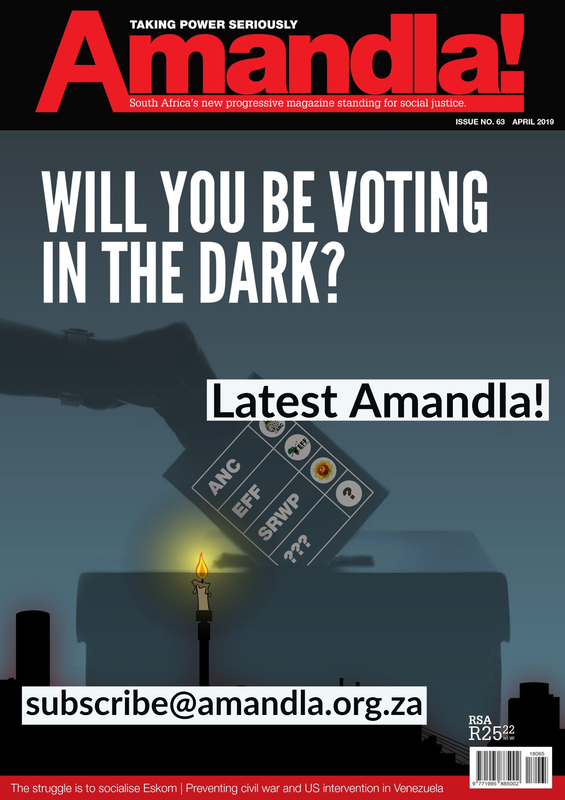 The ANC has privatised services like pension delivery: “People’s engagement on the first of each month is rarely with the state, but with bank tellers, CPS agents, ATMs and grocery store clerks, places where the state is, in effect, absent”. 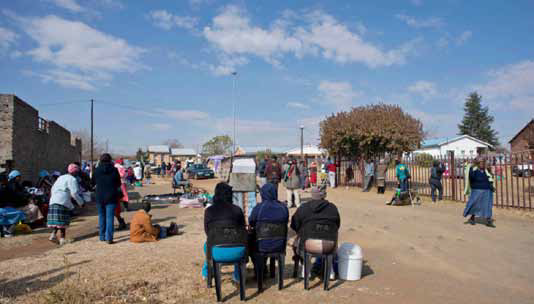 Here, three women who work for a loan shark wait for grant recipients in Thembalihle township in the Free State. “People’s engagement on the first of each month is rarely with the state, but with bank tellers, CPS agents, ATM s and grocery store clerks, places where the state is, in effect, absent…… expansion of services to the poor has been marshalled by the ANC as evidence of its pro-poor developmental policies, while many of these projects have been severely undermined by logics of cost-recovery, privatization and outsourcing that have led to anger and discontent among the poor and the enrichment of old and new elites”. Which history must we look at? Those who say the ANC can be rescued, and returned to its “former glory” must tell us which ANC they are speaking of, and a return to which period. The “morbid symptoms” are nothing new. They are a repetition of an old song. A “throwback”, as the youth would say, to an era we are often cajoled to remember with glory and reverence. But never to the difficult debates in the history of the organization. It is the repeated mistakes that show us how important these periods are, even for the present. Those who cajole us to have faith in the ANC, and its ability, like the ocean, to cleanse itself must remember that failure to learn from historic institutional failures carries serious consequences. Ask any liberation movement on the continent. Moreover, as Arundhati Roy argues, “real resistance has real consequences”. We would do well to be interested not only in what the contending forces are resisting, but also what they propose. More importantly, we must ask whether their ideas, policy and organisational process represent a marked departure from the “morbid symptoms”. If not, then this is another part of a movie we’ve all seen before, and the reel from which it is played is slowly running out. Ayabonga Cawe is a development economist who writes on public policy, race, power, economics and history. 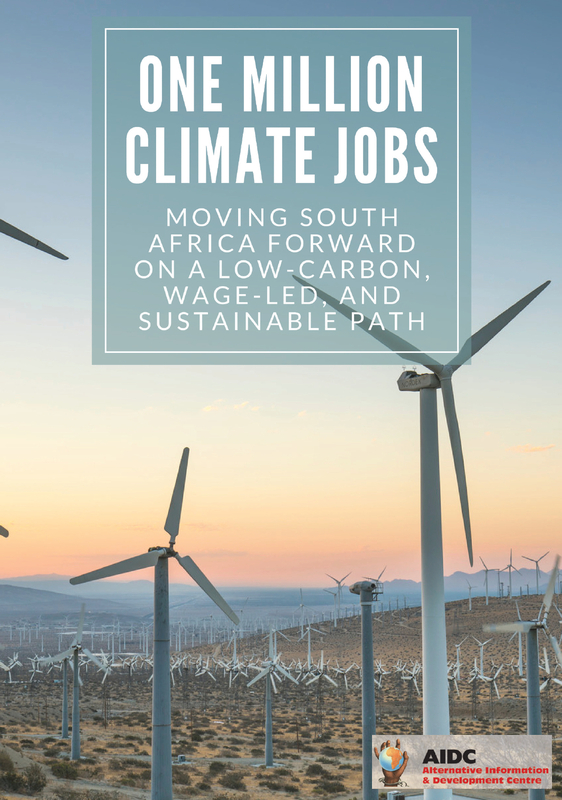 He is Programme Manager of Economic Justice at Oxfam South Africa (OZA). ‹ Are Traditional Courts Bill fears justified?